High torque-capacity, high free-volume geometry and uniform barrel heating ensure consistency is maintained under all operating conditions. Quality is maintained at high output or by low bulk density materials with optional features such as through-shaft cooling and side feeding. Nip rolls transfer the product to the conveyor for cooling. A closed loop water system can be specified to aid cooling. Product is flaked before discharge. 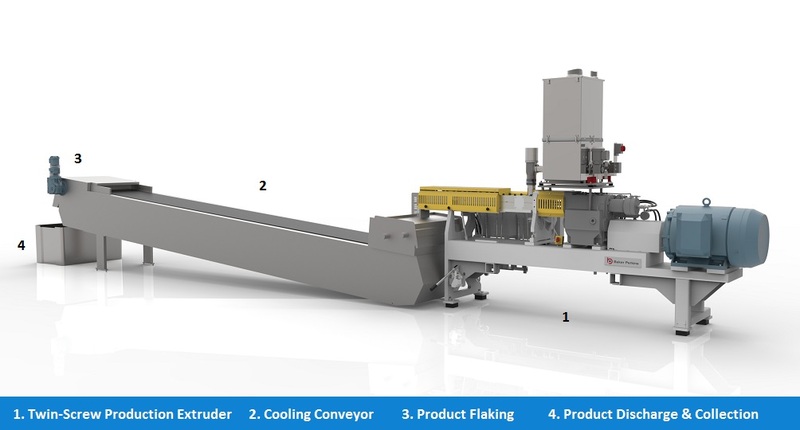 In addition to the extruder, a complete process line comprises ingredient mixing and feeding before the extruder and cooling, with flaking and grinding after it. Baker Perkins works with a number of partner companies who can supply all the pieces of equipment required to put together a full process line. Each one specializes in their particular technology so customers are assured of excellent performance throughout the process. Working with partners ensures that the capacities of the individual units are matched and that mechanical and electrical interfaces are optimized before the equipment arrives on site. Continuous processing gives productivity and product quality improvements over traditional batch processing alternatives. 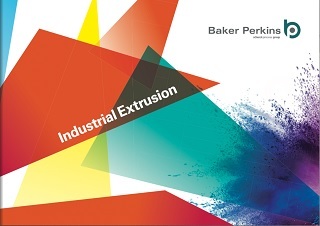 Baker Perkins' extruders can be used for continuous production of solid dosage formulations by either the continuous granulation, extrusion spheronisation or melt extrusion techniques. In a continuous production process, raw materials are fed accurately and continuously into the automated system. Tests and measurements of pre-defined product and / or process characteristics can be carried out continually. These checks are accomplished without interrupting the manufacturing process, and without stopping the equipment or the process. Batch to batch variation is eliminated. Process control is improved. In contrast, batch processing is based on a long series of reactions or events. This can result in time-consuming production procedures, with the need for expensive storage of reaction intermediates. Continuous processing overcomes many drawbacks of batch processing which require time, effort and investment. Continuous processing reduces many process stages to one. This lowers investment, energy, labour and space requirements. Waste shrinks to negligible levels. Cleaning and maintenance are rapid and easy. In a continuous process, rejected product can be handled by live automated feedback, and adjustment to the process parameters and recycling loops. This enables the re-use of some or all reject materials. Rejected material can be minimized by discarding small amounts of product rather than complete batches. The Extrusion Innovation Centre offers full powder coating and non-food production facilities, alongside research and development services for many industrial applications. Parts, service, upgrades and rebuilds for your APV and Baker Perkins machines for as long as they remain in production..
Keep up-to-date with Baker Perkins' latest developments in powder coating and industrial extrusion.